Value buyers are reminded that the one day 2013 Inglis HTBA Scone Yearling Sale will be held this Sunday 19 May at White Park, Scone. 193 yearlings have been catalogued for this year’s sale, with all offerings eligible to be nominated into the $5million Inglis Race Series. Included in the lucrative Inglis Race Series is the $100,000 Inglis Scone Challenge, a 1100m two-year-old set weights event held on Scone Cup Day restricted to graduates of the Scone Yearling Sale that are paid up for the race series. Runners in this year’s Inglis Challenge, which will be held tomorrow Friday 17 May, were purchased as yearlings last year for between $1,000 and $47,000. The winning connections could earn themselves $80,000 when adding the $20,000 BOBS Bonus available to the $60,000 first place cheque. Many of the Hunter Valley’s leading breeders are represented with yearlings in this year’s Scone Yearling Sale including Arrowfield Stud (19 lots), Widden Stud (14), Middlebrook Valley Lodge (11), Attunga Stud (9), Goodwood Farm (8), Vinery Stud (8), Edinglassie Stud (7), Lincoln Farm (7), Southern Cross Breeders (7) and Yarraman Park Stud (7). The Scone Yearling Sale is renowned for being great value, exampled by $32,000 purchase Hot Danish which earned over $2.3million on the racetrack. Recent stakes winners include $23,000 buy Wowee and $36,000 purchase The Huntress, while $18,000 graduate Goal Keeper will look to add to his S$400,000 in earnings when he lines up in the Group 1 KrisFlyer International Sprint in Singapore this weekend. The 2013 Scone catalogue includes the progeny of a wide range of stallions including first season sires All American, Denman, Dreamscape, Duporth, I Am Invincible, Krupt, Manhattan Rain, Nicconi, Onemorenomore, Red Arrow and Time Thief. Proven and emerging sires with yearlings in the sale also include Ad Valorem, Al Maher, Authorized, Bel Esprit, Choisir, Commands, Dane Shadow, Danzero, Domesday, Flying Spur, Hussonet, Magic Albert, Mossman, Northern Meteor, Not A Single Doubt, Ready’s Image, Rock Of Gibraltar, Sebring, Snitzel, Spinning World, Starcraft, Statue Of Liberty, Tale of the Cat, Teofilo, War Pass and Zizou. Siblings to stakes winners Budriguez, Rock Me Baby, Johnny Reb, Tenzing, Terror Force, Cocinero, Brakim Lass, Forest Frolic and Mrs Kipling are set to be offered, as are the progeny of stakes winning mares Made Of Diamonds, Patpong, Shapira, Starstruck and Before Too Long. 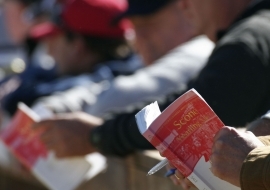 The 2013 Inglis HTBA Scone Yearling Sale begins at 10:30am on Sunday. Buyers are welcome to inspect yearlings at White Park on Saturday. The catalogue for the 19 May sale can be viewed online at www.inglis.com.au and on the Inglis Sales iPad App.